who might turn the administration house to a disco floor. 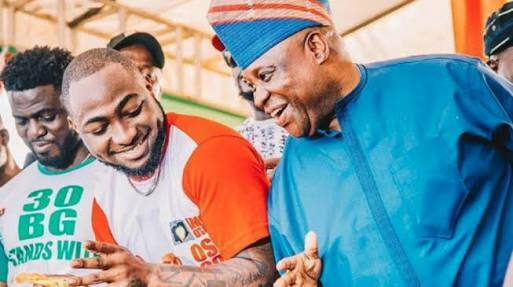 Ademola Adeleke, congressperson speaking to Osun west and the governorship competitor of the PDP, is prestigious for his dancing capacity, which earned him nickname 'dancing senator'. governance is serious business and not for dancers. He said Gboyega Oyetola, APC governorship candidate, was coming in to continue the ”progressive works” of Rauf Aregbesola, governor of the state. Oshiomhole spoke at the APC governorship rally in Osogbo on Tuesday. “These are very trying times for our country; we need people who are competent not apprentice, we need people who can manage finances, we need people who know how to generate and that is where I believe Oyetola will have an advantage over any other person that is contesting the same office,” he said. “He is a successful person in the private sector where the real resources are. “ I understand two days ago they had a debate and one of the aspirants was doing ‘skelewu’ as the debate was going on and when they asked him, he say motor break down. “May the government of Osogbo never break down, and it will not break down if it hadn’t broken down under Aregbesola, it will not break down under Oyetola. “God forbid a partying governor that will turn the government house to a disco house. Governance is serious business and not for dancers. In times like this, we need men with brain; Oyetola is the man with the brain, times like this we need men with passion for their state, Oyetola’s passion for Osun state and for Nigeria is not in doubt. The Dancing Senator is hoping to defeat APC same way he defeated them for Senate.